Educator, MLA (1950-1953), MLA (1954-1957), MLA (1958-1959), MLA (1959-1962). Born at Winnipeg on 8 December 1910, son of Michael Hawryluk (?-1940) and Maria Marcinow (?-1964), he was educated at Machray School, Aberdeen School, St. John’s Technical High School, and the University of Manitoba (BSc 1933, BEd 1955, MEd 1963). He taught at High Plains School (1932-1933) and Polson School (1942-1944), was later Principal of Polson School (1946-1956), Melrose Junior High School (1956-1961), and Munroe Junior High School (1961-1974). He retired in June 1974. 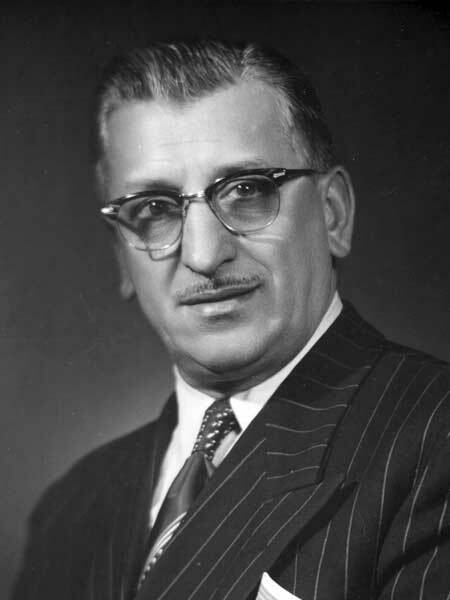 He was first elected to the Manitoba Legislature at the 1949 general election, being re-elected in 1953, 1958, and 1959 until his defeat in the 1962 general election by Mark Smerchanski. He served on the Senate and Board of Regents of the University of Winnipeg (1970-1977). In 1952, he married Olga “Ollie” Iwaskiw. He was a member of the Winnipeg Canoe Club, Palmanaki Club, Schoolmasters Club, Manitoba Teachers’ Federation, Trident Curling and Golfing Club, Winnipeg Chamber of Commerce, Winnipeg Teachers’ Five-Pin Bowling League, Ukrainian Professional and Business Men’s Club (President, 1961), Ukrainian Male Chorus, among others. His contributions to the community were recognized by a Canadian Centennial Medal (1967) and a special award from the River East School Board (1968). He died at Winnipeg on 5 December 1975 and was buried in the All Saints Ukrainian Catholic Cemetery. [Photo caption], Winnipeg Free Press, 27 October 1944, page 3. The Canadian Parliamentary Guide, 1951. “E. Kildonan teaching staff announced,” Winnipeg Free Press, 14 September 1953, page 22. “School head Hawryluk keeps eye on education,” Winnipeg Free Press, 24 March 1955, page 3. “Haines named E. Kildonan School Superintendent,” Winnipeg Free Press, 29 December 1955, page 9. “Volleyball queens,” Winnipeg Free Press, 21 November 1956, page 30. [Photo caption], Winnipeg Free Press, 15 February 1962, page 6. “University results,” Winnipeg Free Press, 16 May 1963, page 57. “Munroe school tea,” Winnipeg Free Press, 30 May 1974, page 24. “Reception to honor Hawryluk,” Winnipeg Free Press, 18 June 1974, page 6. Obituary, Winnipeg Free Press, 6 December 1975, page 44.